Reminders are needed, from time to time, of the pure joy of driving, and Volkswagen’s Jetta is just the thing to pleasantly jog one’s memory. The conservatively styled Jetta’s exterior has been slightly smoothed and refined for 2016, but its mechanical workings needed no tweaks. The Jetta feels much like the small nimble BMW’s of years past, before they became power hungry heavier brutes as they grew ever larger. 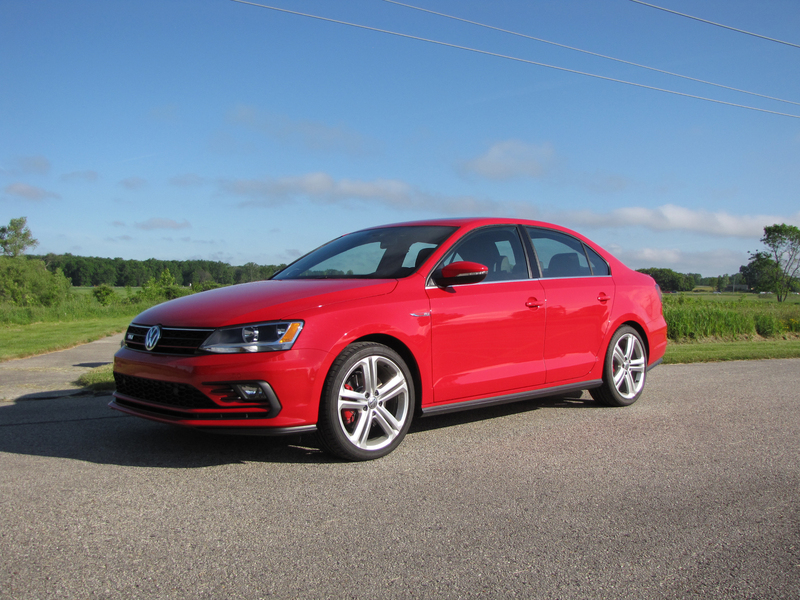 Jetta is a near perfect blend of compact family sedan and sports sedan and lucky for most of us, continues at a modest price compared to that of today’s SUV-laden market. But even at a slightly higher price tag the Jetta would be a bargain, if, and it’s a big if, today’s drivers knew what they were missing by driving crossovers and SUVs. 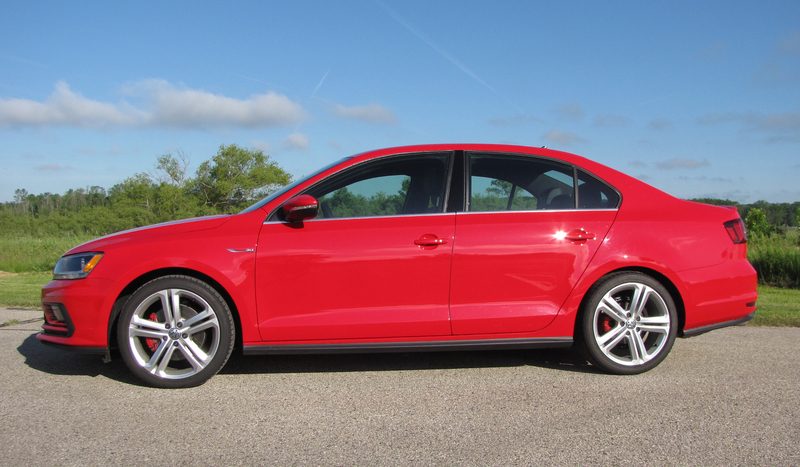 In short, Jetta is quick with lively handling made all the more fun by VW’s fine 6-speed manual transmission. Call it sporty, call it a blast, but also call it practical because as a compact sedan it will easily seat four average sized adults and carry their luggage too with its generously sized trunk. I hate to brag but….. This car blog has presented me with opportunities I might not have had. I have gotten to drive cars that many of you dream about like a Ford GT40, Chaparral 2F, TransAm Javelin, and an Indy car. Ok, time to fess up. The cars I mentioned are actually 1/32nd scale slot cars. Like a lot of you guys, I started out with HO stuff, then lost interest, flipped the track and cars on eBay. So I’m good, right? Until I started to work for a publisher who published a magazine targeted to the hobby shop owner. My co-workers did reviews on 1/32 slot cars and had tracks to race them. Being a car guy, they invited me to a race night to watch and even let me race a car. Boooom, that was it, I was in again. I was buying cars like….well I don’t know….deliveries were almost daily at home and work. Like a slot car drug house. I’ve slowed down quite a bit now. Below are some of my cars. There’s a lot more where that comes from. Ninco, now being distributed exclusively by Professor Motor in the U.S., is reintroducing a series of five somewhat generic Formula 1 cars to its lineup, a good product for clubs or groups that enjoy racing identical cars. These racers resemble the former SCX F1 cars in that the front suspension looks real, with A-arms and wheels that are steerable, being controlled by the slot’s movement. The body resembles a Team Jordan F1 car from the late 1990s to early 2000s and in fact is labeled Jordan on the chassis. Open wheel racers will welcome the new models. This racer is sturdy and likely the body will hold up well in heavy use. The nose wing is thick and well attached to the body shell as is the rear wing, which is molded into the bodywork, so less likely to snap off when the car de-slots. Its mirrors are the most likely body part to be lost over time. That said, as with the former SCX models with steerable front wheels and a more detailed suspension, I suspect the thin suspension parts will snap after several heavy hits into other cars or during a serious de-slot. The good news is the cars will run even with damaged front suspensions, they just won’t look as realistic while on track. Ninco uses its normally peppy NC-14 Speeder motor that generates 20,600 rpm. Straight line speed should be good, but on my test track the car was more than a full second slower than a similar Scalextric open-wheel car, with silicone tires. Silicones usually will cut a half-second off a lap time. The standard tires here are a very hard rubber and grip is minimal. They also are quite stiff, so hard to remove from the wheel, but you’ll want to purchase proper silicones to give the car more grip. That helps in turns, but also in putting power to the track in a straight line. The magnet Ninco uses is small too and sits in front of the inline motor instead of behind it, as in many other slot car chassis. That placement doesn’t help give it good rear tire grip or balance, so likely with slicks the Ninco will still be a hair slower that competitors. Again, if your buddies are all racing the other Ninco F1 cars, that won’t matter. For gearheads, literally, the Ninco F1 has a 2.48mm axle and 9-tooth pinion and 24-tooth crown gear. The car weighs 73 grams and feels quite solid. The test car was red with white and black trim on the wings and car’s sides and engine cowling. This is car No. 3, while the other cars in this series are No. 5 in black with slight yellow trim, No. 2 in blue and white, No. 15 in yellow and black, and an all-white model you can decorate yourself. 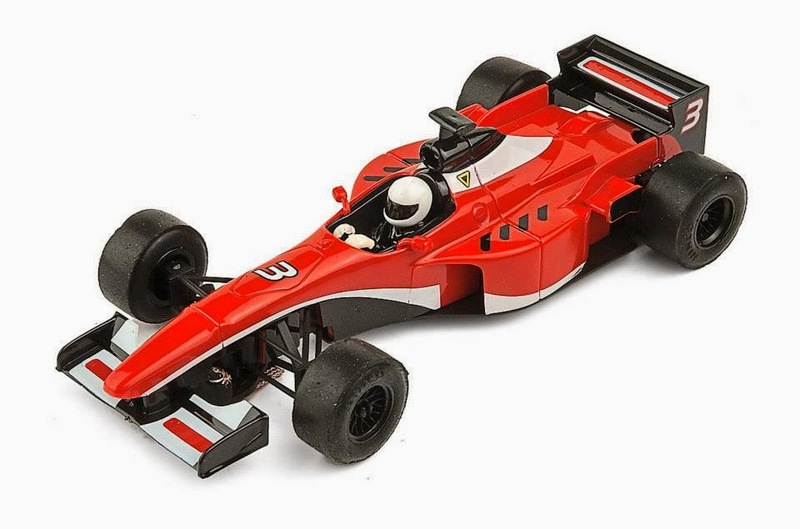 Experienced slot car racers will recognize this as a somewhat simplified F1 car, but a good looking car for a newcomer. But you’ll need silicone tires and likely an additional magnet to keep it firmly planted on the track and able to use its power. I Always have loved Can-Am cars, their shape, their power and the fact that many of the best drivers from the late 1960s and early ‘70s ran them. 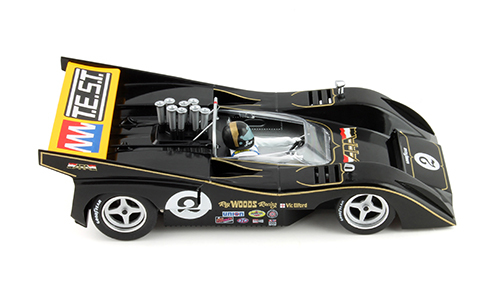 So for slot car racers it’s happy news that Slot.it is extending its stable of Can-Am (Canadian-American Challenge Cup) cars with a new McLaren M8D from 1971. Slot.it has been producing highly competitive slot racers for 10+ years and this McLaren is as fast as its past models. Slot.it cars have lightweight chassis with strong magnets and are well balanced to begin with. Add in a 21,500-rpm sidewinder motor and they are fast and easy to drive right out of the box. The real racer’s engine cranked 680 horses, so it’s appropriate that Slot.it gives the model a high-revving motor. There aren’t a ton of Can-Am cars available, but this is a nice addition with its crisp paint and tampo printing job to create a stunning glossy black racer with yellow rear wing. Ford’s Mustang was the Boss of Trans-Am racing in the early 1970s with the likes of Parnelli Jones and George Follmer winning regularly to put Chevy, Plymouth and AMC on notice. Scalextric has been mining that popular muscle car vein with is fast and furious 1:32 slot car lineup for several years. 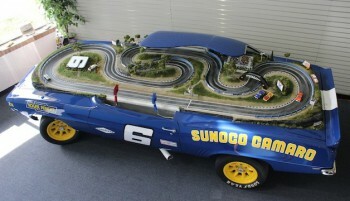 Racers in our slot car group have been buying Scalextric Mustangs and Camaros for years because they are fast – period. They also stir our memories of Trans-Am races from the golden age of muscle and pony car racing, the 1970s. 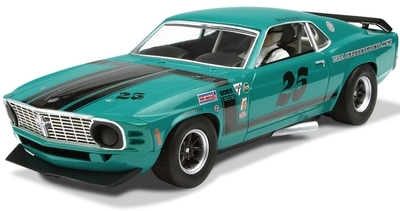 The latest Scalextric offering is a Grabber Green 1969 Mustang fastback driven in part of the 1972 Trans-Am season by little known Mike Folsom with Libre Racing International. Team results were nothing exciting, but this slightly turquoise leaning green Mustang was a hit with fans. One reason, it was the only factory-Grabber Green Mustang created by the factory for racing.